There are many ways to check epf balance/pf account status on UAn Portal as well as Epfo Portal. pf balance without UAN number by UAN Portal. without pf number in epfo employees corner. Track Pf balance on Mobile by SMS alerts phone call to epfo toll-free number. Next, go to the employee’s service page between employer and uan services. Click on the For employees option and next click on Know your EPFO balance link displayed on the screen. Now select the EPFO office where your account is drawn. Leave the extension field blank space if your account does not have one. Now enter the Name & mobile number. The entered mobile number that recorded with EPF account number. Finally, success full submission of above details you will get details your mobile through SMS. EPF statement available online on the official website of Employees provident fund organization(EPFO).If you need to Know EPF statement online some particular details are required. Now an availability of Check EPF statement with EPF account number. By using with EPF account number you can access EPF account statement through online. Epfo members can download the Pf statement for checking your pf balance online at an epfo portal. checking with the mobile number only works through uan number. In Case of if you checking via epfo balance at epfindia.com then employee have to provide PF Number. then visit this link http://www.epfindia.com/site_en/KYEPFB.php, enter your epf number and click know balance you will get PF Balance details by SMS to registered mobile. How to check pf balance with uan number? the simple answer is by login to uan portal, download the uan passbook from uan portal services website. or else get pf balance with the epfo mobile app. you can get pf balance details in the form of passbook. 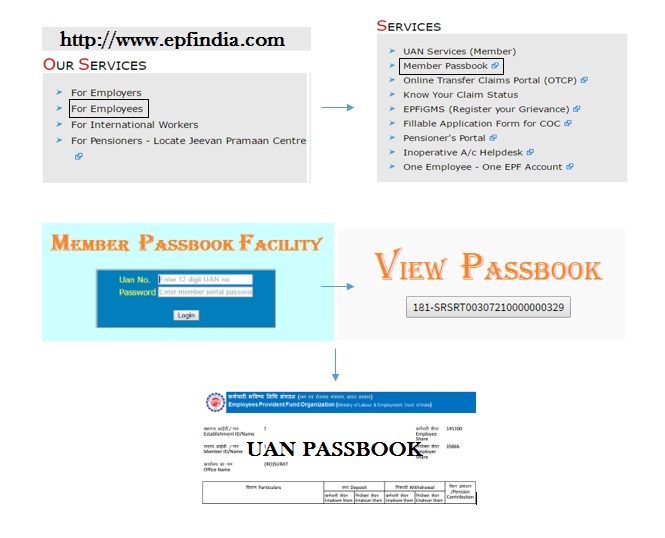 EPF e-passbook is an online version of check PF statements online. Employees are easy to check EPF status and transactions month dare wise through online. The following steps are downloaded EPF e-passbook. Firstly login to pf passbook portal. And now register with the mobile number, address, and date of birth. Click on get Pin and you will get Pinto a registered mobile number. Next, click on download e-passbook and enter the EPFO office state and EPF office name. Fill the details of Company PF code, PF ac.no, and name in blank spaces. And click on the Get Pin and you will get a pin to your mobile and update the link with the PIN. After 3 working days, you will get epf passbook on the same page of EPFO portal. For checking pf balance on epfo portal without PF Number and UAN Number. then employees have to log in to epfo members portal then download the epf passbook from the download section. Now uan passbook download is the only way to know the pf balance. member now download epf passbook with uan number and password. this process also called as pf balance check with uan number. anyway, you are in the right place to download the uan passbook with help of support. The uan passbook/ pf passbook download has the knowledge of financial statement. The passbook gives credit, debit and balance history of your UAN account. Some of the information in the passbook is given below. Check UAN Status, UAN Login Portal. UAN Helpdesk. members.epfoservices.in>> login>>members download >> epf statement / passbook. Epf passbook contains All epf balance contribution details including interest employer payment etc. Employees easy to check the PF balance with EPF number through online.An EPF online balance checking facility available on official website of Employees provident fund organization. Following steps are to know PF balance by EPF number. Visit epf India gov.in and click on epf balance. Then that page redirects you to another checking page. The select state and regional epf office enter your PF number. Member name and Mobile number. Then click On get PF balance. You will get epf amount details to Your Mobile number. Now UAN Member portal and employer UAN portal merged into Unified UAN Portal. Anyway, you can still check Pf balance with UAn number in following ways. check Epf status by sending an SMS to epfo tollfree. You can call uan toll free number to check current pf balance along with last contribution and interest. Download the epfo App on your phone enter Your UAN Number and check the pf balance. You can monthly SMS alerts if you registered under UAN portal. NOTEL without UAN Number you cannot know the epfo balance. Here you can go with the below four epfo balance knowing methods check out the PF balance in a fine manner. Then EPF department launched the application for the major Smartphone which lets the customer check the balance with the free cost and it is applicable to get balance details at every time. Then you have to type text and send the SMS to 7738299899. Even there is one more option to obtain texts In 10 Vernacular language such Hindi, Telugu, Tamil, Malayalam, Bengal Gujarati, Marathi, Punjabi, Kannada. On are completed sending the SMS, the EPFO will send the reply SMS on the same time so you can ready to check out the balance in a fine manner. Though the method is very simple, the EPF employee can collect all details of the balance in a winning manner. This method is very simple which can take place within two seconds to collect the EPFO balance details . To get balance, the customer has to give missed call to the given designated mobile number by then EPFO. Once you send the SMS, just receive the balance details within second to the registered mobile. This service is completely free without meeting EPF branch office. Here it is the number, you must give missed call 011 2290 1406 and it can store in the phonebook. Hence, this method is used to check out the balance by verifying then EPF records. In the case of any wrong information, just you have to correct by meeting the EPFO on the same day itself. Now, you can get balance details with your account name, date of birth and much more. Note: pf balance checking by uan onl.y works. If you want to get registration over the portal for passbook download, just make use of the single mobile number for registration. One member can view the maximum EPF account balance. Hence the EPF employee can simply check out the balance detail by using any method. the above option will be simple and take very less time to follow by every register employees. In a case of additional doubts, the candidate has to hire toll-free number to clear all your doubts on the same time itself. Most employees Now logging into UAN Member portal, for only one reason to inquiry their pf amount Account statement. UAN members can download UAn passbook along with UAN card In Portal download section.